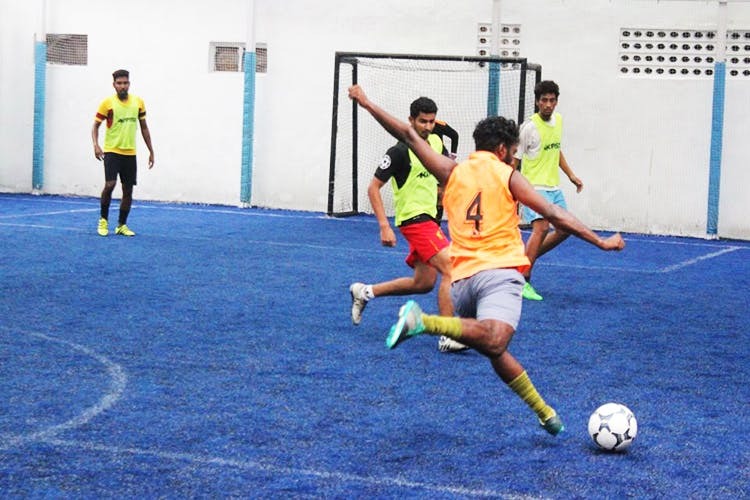 A south Chennai entertainment hub, Chaos Entertainment has a range of games for both the couch potato and the sports enthusiast. Started in 2017, Chaos Entertainment is an entertainment hub along the lines of Nassaa Uth Hub, as it aims to offer both indoor and outdoor entertainment and activities. Unlike most of the other entertainment hubs in the city, Chaos chooses to specialise in just games. For the gamer, there’s console gaming on PS4s with all the latest titles (Fifa 18, NBA 18, etc) along with motion sensors for those fun and tiring tennis matches like the ones you play on the Wii. They’ve got VR gaming too and are looking into Augmented Reality games too (kinda like Pokemon Go!). If you want a little more realism in your virtual battles, they’ve got laser tag in their custom built neon arena! They provide all the equipment from guns to armour, all you need to do is bring your friends (aka enemies to shoot!). Outside of gaming-related entertainment, there’s also futsal. Their indoor turf football pitch is big enough for a 4v4 game and has lights, so you can play past sundown. Oh and the pitch isn’t green, it’s blue! Trust us, it’ll make for a picture that stands out. Sports fans rejoice, they’ve got a screening area where they screen all sports matches and have screening events for big matches like the upcoming IPL final! Speaking of events, they’re open to corporate discounts and group packages for large groups and can handle up to 50 person groups! So do get in touch with them to know more, especially if you’re looking to block specific time slots. Apart from match screenings and parties, they host their gaming tournaments too, with boatloads of prize money to be won. Price wise, their rates for the aforementioned services are comparable with other gaming arcades, expect to pay around INR 100 to INR 200 if you want to just try stuff out. If gaming is your thing then you’ll enjoy checking out the cool VR stations and consoles you can play on, if not we think you should come here for a game of laser tag, it’s a lot of fun and it’s a physical activity. Football fans will love the pitch as the turf quality is great.